Officer Meyers was still a rookie, but she was already respected by her superiors for her dedication. Rookie is slang for someone who is new at something. 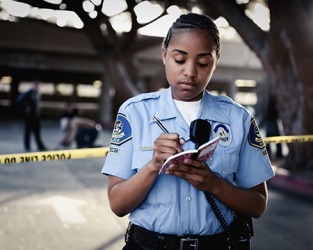 A new cadet who has just joined the police force is an example of a rookie. "rookie." YourDictionary, n.d. Web. 09 April 2019. <https://www.yourdictionary.com/rookie>. Sports a first-year or first-time player in a particular league, event, etc. a. An untrained or inexperienced recruit, as in the army or police. b. An inexperienced person; a novice. Sports A first-year player, especially in a professional sport. An inexperienced recruit, especially in the police or armed forces. An athlete either new to the sport or to a team or in his first year of professional competition, especially said of baseball, basketball, hockey and American football players. (UK) A type of firecracker, used by farmers to scare rooks. The game was going well until I made that rookie mistake. From recruit and -ie, thought to be an alteration of recruit, another reasonable origin is Dutch broekie (short for broekvent (“a boy still in short trousers")), a common term for a shipmate. People everywhere go back and forth between feeling stunned and amused when they watch the amazing video footage of Rookie the Golden Retriever and his human, Carolyn, trip the light fantastic. After being named Rookie of the Year, Jordan and the Chicago Bulls continued forth, making it into the playoffs for several consecutive seasons until 1991 when the team entered the NBA Finals. Many tattoo enthusiasts seek out the highest profile tattoo artists, such as Los Angeles' very own Kat Von D for art that is both meaningful and exquisite in detail rather than opting for a rookie or newbie artist. The fear of any rookie online shopper is having to return merchandise, and 2BigFeet.com promises customers that any unworn shoe in new condition can be exchanged before 30 days for a full refund. Though the Bulls had only won 28 games the prior season, Jordan marched forth to bring his team into the limelight, finishing his rookie season with an average of 28.2 points per game.